Last year the Ratha Yatra wove its way, like a garland of spiritual devotion, through the heart of Sydney. This year, on 19 March, 2011, we aim to do the same with HH Kadamba Kanana Swami to lead the way. Come and meet us at the Maquarie St end of Hyde Park, in Sydney, on March 19th and from 12:30pm - to approximately 3:30pm we will sing and dance our way to Darling Harbour. 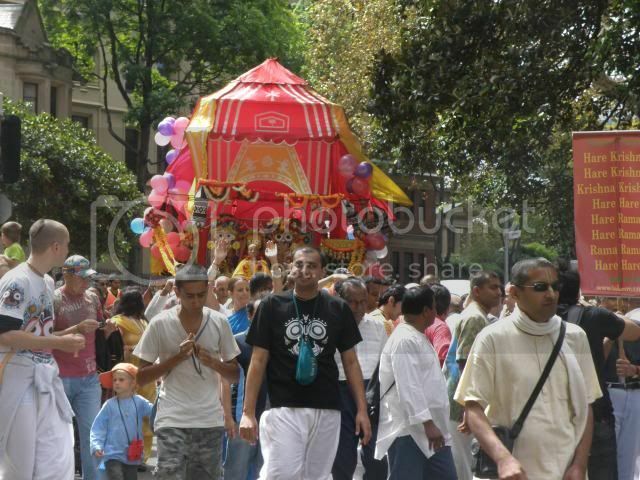 Come along and join the Festival of The Chariot and celebrate the annual Ratha Yatra parade. Click here to get on to Facebook and let us know you are coming. last year the weather participated in the festival by providing a great day and the people of Sydney joined in as usual with their enthusiasm and appreciation. The Ratha Yatra is a great opportunity for the wider community to come into contact with the deities of Lord Jagannatha, Subhadra and Baladeva and with the devotees of Lord Krishna. During the parade in 2010 books about Krishna consciousness and sanctified food, or prasadam, were distributed to people who are attracted by the sights and sounds of a Ratha Yatra. Parked at the entrance to Sydney’s Hyde Park the Rath cart was profusely decorated with flowers and balloons. Srila Prabhupada’s murti and the deities arrived and great care was taken to make sure their dress and jewellery was just right so everyone looked their very best for the festival. Much care was also taken to help Srila Prabhupada and the deities aboard the cart. Last year HH Kadamba Kannana Swami and Sri Prahlada started the kirtan and the crowd began to build. Many people who were passing began to participate in the worship of the deities who have pride of place on the cart with Srila Prabhupada. HH Bhakti Charu Swami also joined the parade singing and dancing along the entire route. Singing the Mahamantra, and dancing to the transcendental sound of the music, devotees and friends pulled the cart through the streets of Sydney, immediately attracting the attention of people everywhere. Members of the public had cameras, phones and video cameras out and all the way along the parade route people line the street taking photos. Before the sun has set on the day Facebook joins into the Ratha Yatra festival as onlookers and devotees alike upload what they’ve captured of the days proceedings to share with their friends and family. Bystanders cheered and waved as hundreds of devotees showered the city streets with sound and colour. Many people joined in singing and dancing along. Everyone is encouraged to take a turn pulling the cart by the ropes, and quite a few people have a go. Some people get really happy when they see the cart carrying deities and devotees singing and dancing joyfully. On the way a construction worker caught up in the transcendental moment danced in front of his co-workers, jumping up and down. All the people on the street began to take photos of him. 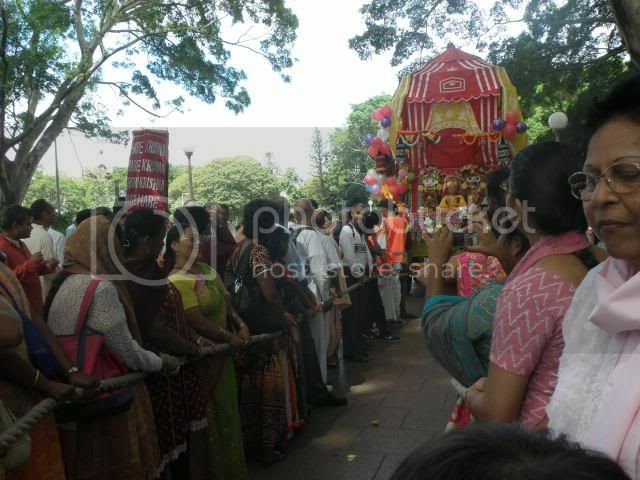 Each year devotees are involved in many ways to ensure the Sydney Ratha Yatra is a success. For the last few years Prananatha Dasa has organised the security team. To obtain a permit for the parade the authorities require the organisers to assist with directing the participants and ensuring things go as safely as possible. Each year as the parade reaches its destination at Sydney’s Darling harbour it signals the beginning of the annual two day Holi festival, organised by Bharatiya Vidya Bhavan. Last year Bhakti Charu Swami led a kirtan and gave a talk on Krishna consciousness to Holi festival audience. A very long line formed as soon as the prasadam distribution began. Ratha Yatra is celebrated at various locations in the Sydney region. Srila Prabhupada attended the first Ratha Yatra festival in Australia, held in Melbourne, in June, 1974. Click here to see last years photos on Facebook.